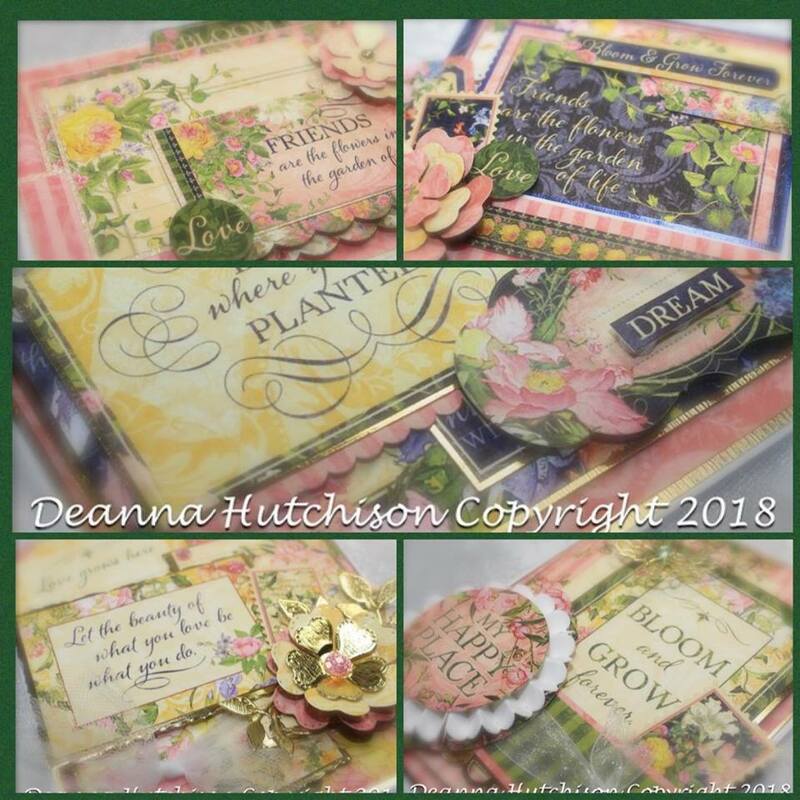 Scrapbook-N-Memories is sooooo excited to announce that our good friend Deanna Hutchison is finally coming to Missouri to teach 3 different classes of her spectacular 3D layered card classes. Deanna is the designer of the Amazing Layered Christmas card classes we have been doing the past 3 years using Kaiser Kraft collections. Her style is spectacular and I call them my "mantle cards" they are so beautiful! Deanna is from British Columbia, Canada and has been in the Papercrafting business for almost 20 years. She loves to create all types of projects, from mini albums to printer’s trays, layouts to mixed media! But she really LOVES making cards that are multi layered and FULL of textures, details and dimension. Over the years she has worked with many design teams and companies and currently has over 200 projects published in Magazines and Idea Books, as well as a DVD series that came out several years ago. Deanna was one of the featured instructors on Canada’s Caribbean Crop and Cruise, as well as having been chosen two years in a row to be one of the Main instructors at the Teresa Collins event in Las Vegas—an international event with over 200 students attending each year. In addition, she is also the buyer and co-owner of Clipper Street Scrapbook Co.—a large scrapbook store in western Canada. 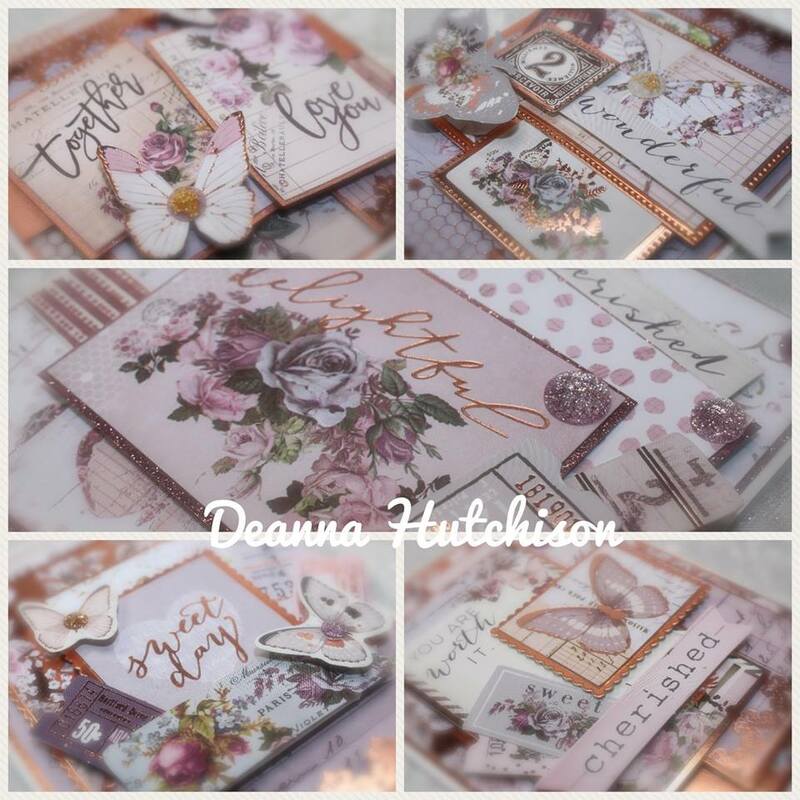 Over the past couple of years Deanna has partnered with KaiserCraft to teach her exclusive designs to students from all over the world. Her passion for teaching and sharing, creates a warm, fun and stress free environment in the classroom. Join us for an inspired movement of creativity and imagination- where we fuse together the vintage, the steam punk and the shabby chic. Where butterflies and botanicals meet gears and metal embellishments. These beautiful all occasion cards feature stunning imagery, monochromatic tones and tons of layers! 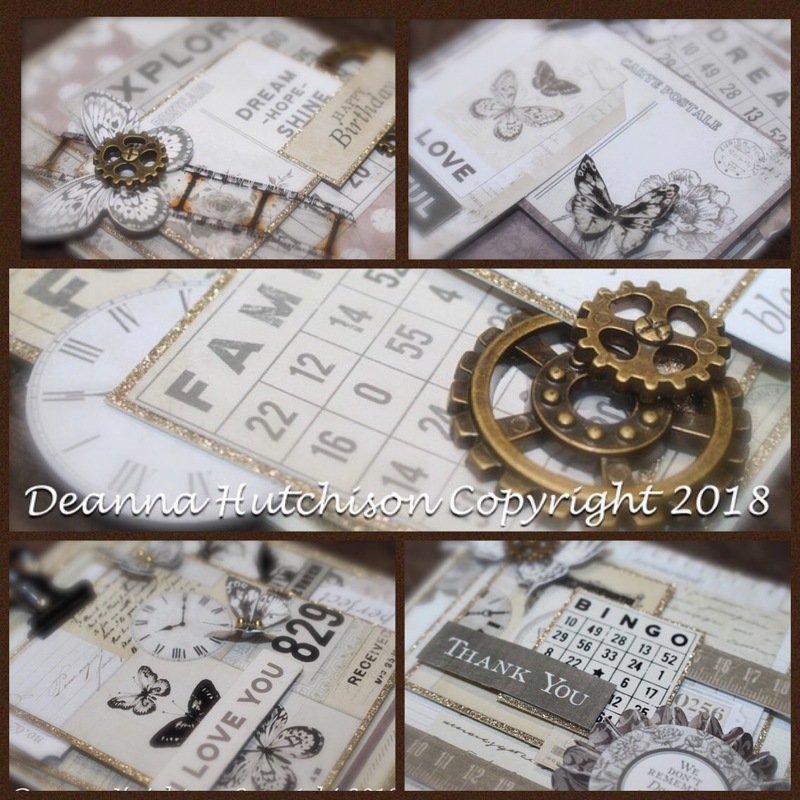 Deanna will guide you thru the process of creating classic cards while showing you that even the littlest of details can have the biggest impact. As an added bonus, you will have lots of die cut and paper leftovers to create even more at home. All that glitters is not gold, sometimes it's a gilded fusion. Close your eyes and you can almost feel the warm breeze and smell the faint fragrance of these Sweet Lavender Cards. We are celebrating the lovely every day moments with these gorgeous layered all occasion cards. In this class, we will be using beautiful shades of lavender, soft pastels, butterflies and vintage embellishments to create FIVE stunning cards perfect to celebrate the arrival of Spring. Deanna will guide you thru the process of adding layers and dimension to your cards to give them depth and substance—and you will have lots of wonderful ephemera leftover to create even more at home. Designed by Deanna. Class Fee: Early Registration Price $38.00, early registration ends May 1st. Only 20 seats still available. Graphic 45 fans rejoice. This stunning card collection celebrates all things floral! You will create 5 stunning cards featuring pretty pinks, sunshine yellows and bright indigos, these cards will be perfect for any occasion. Each card has tons of layers and pretty details with hints of glitter and shimmer. Brighten someones day with this bouquet of beautiful floral cards. Deanna will guide you thru the process of adding layers and dimension to your cards to give them depth and substance—and you will have some wonderful ephemera cards leftover to create even more at home. Designed by Deanna. One Day only Guest Designer. 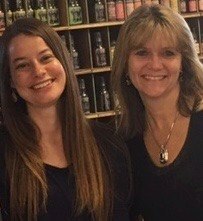 We are pleased to announce that for "ONE DAY ONLY" Saturday, November 16th the lovely Mrs. Jen Starr will be teaching 2 Different class here at Scrapbook-N-Memories!! About our Guest Designer: JEN STARR Jen Starr is a fully Certified and Ranger Recognized Instructor. She was the 2007-2008 Design Team Coordinator for Ranger Industries and continues to teach and do private design work for them. She enjoys being a Golden Ambassador for Tattered Angels and has recently designed the color palette for the 2012 Spring and Summer Limited Edition Glimmer Mist. As a Mixed Media Artist with a fine art background there are many companies and products that inspire Jen and she is an endorsed educator and works closely with many of them such as Ten Second Studio, Canvas Corp, 7Gypsies, Stampers Anonymous, Faber Castell, Basic Grey and Prima, just to name a few.. Jen has designed several signature product lines and her projects have been featured in many publications in the US and Europe including the “Ink Essentials” book. Jen has been scrapbooking, card making and making colorful yet vintage inspired mixed media art since she married her wonderful husband, Mike, in 1997. They lives in Northern New Jersey and have 2 children (10 year old Ryan and 8 year old Maya) who are the subject of much of her work. Empowering students with product knowledge and creative techniques is what Jen strives for in each of her classes! She has taught technique based classes at stores, crops, large events and conventions all over the US and regularly in Europe and Canada. She has also been a feature instructor on several crafting cruises and taught at events such as CHA, CKU, CKC, Memories Expos, Scrapbook Expo, Bonanza in England, several times at Scrap-A-Ganza in the Netherlands and at ScrapEvent in Sweden. Jen also regularly demos inking and stamping techniques at trade shows such as CHA, SMAC in Paris, Krea Vak in Holland and various Distributor events around the world. Jen absolutely loves to teach her students to use their creativity and help them think outside the box. It makes her so happy to be able to share her skills, knowledge and love of the art of scrapbooking and stamping with so many others. You can sign up for one or two of Jen's amazing classes. Each class will you will learn how to use different products and they are jam packed full of amazing techniques. Stop by the store today to reserve your spot in this once in a life time opportunity. Since this is a guest designer I have to pay for each kit/space I give her a head count for. You must pay for the class at time of registration. All Class fees go to the designer, so we will accept cash and check only. Credit and Debit cards cost me money to accept. Thanks for understanding. Mixed Media Canvas (3 hours $50) 10am-1pm (every canvas will be unique…these are just 2 examples!) Working on a 12x12 stretched canvas you will create a mixed media masterpiece full of color and texture with a variety of surfaces! You will learn fun and unique ways to use a variety of mists and paints from Art Anthology and beautiful mediums from Viva Decor to create gorgeous dimensional effects that will bring your art and photo to life! No previous painting experience is needed! **Please bring to class: Gesso; collage glue such as Gel medium or Ranger’s Multi-Medium; red tape or Fabri-tac for use on fabric/lace; a few paint brushes including a 1” flat or larger; One larger photo (black and white looks great!) that the main image can easily be cut out. I usually recommend 5x7” or larger. Sizzix Desinger is Teaching at our store! Another amazing opportunity that you don't want to miss out on. For "ONE CLASS ONLY" Thursday, October 4th Stephanie Barnard will be teaching a 3 hour Card Class here at Scrapbook-N-Memories!! If it’s possible to live, breathe, eat and sleep scrapbooking and stamping, Stephanie Barnard is giving it her best shot. Besides serving as the Sizzix spokesperson, she also offers the company’s research and development team invaluable insights into new products from the crafter’s perspective. She is also a licensed designer and the inspiration behind her own line of creative products for Sizzix. Stephanie is the owner and designer of a clear stamp company, The Stamps of Life. Their stamps are proudly manufactured in the USA. In addition, she is a highly sought-after teacher and demonstrator and has appeared on numerous television shows with her work included in many books, magazines and websites. Join us as we "Flip Over Flip-its!" We will be stamping, die cutting and creating with Stephanie Barnard, the designer of the Sizzix Flip-its Dies! In this fast paced class, we will create one regular card and two Flip-it Cards. You'll get to experience why Stephanie loves ColorBox Premium Dye Ink Pads, secret stamping tips and you'll even learn about the "Secret Weapon! "Our Stamps are PROUDLY made in the USA. What products you’ll play with: Flip-it Dies, ColorBox Premium Dye Ink Pads, The Sizzix Big Shot, Embossing Folders and MORE! What techniques you’ll try: Stamping, embossing, die cutting and More!